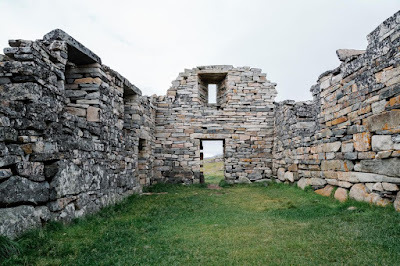 Some time ago, I did an article on the other website about the ruins of Hvalsey church, the ruins of a Norse parish located on the southwestern coast of Greenland. It dates from the 10th century during the apex of Norse colonization. Hvalsey was part of the Greenlandic Norse "Eastern Settlement", which at its height contained only a few thousand Norse settlers scattered over a handful of towns and about 500 rural farmsteads. The settlement of Hvalsey gradually dwindled and was evacuated sometime in the 15th century; the last recorded activity there was a wedding in 1408. The environment of southern Greenland is harsh and unforgiving. Even in the warmest months it seldom rises above 60° F. The winters are long, with blistering snows and gale force winds blowing in off the Atlantic. From November to January the night lasts twenty hours a day, covering the region in a kind of perpetual twilight. The shallow, rocky soil makes for poor farming; most of the Norse settlers survived off the grazing of cattle or hunting and fishing. Contact with mainland Europe (or even the Norse settlements at Iceland) was infrequent. 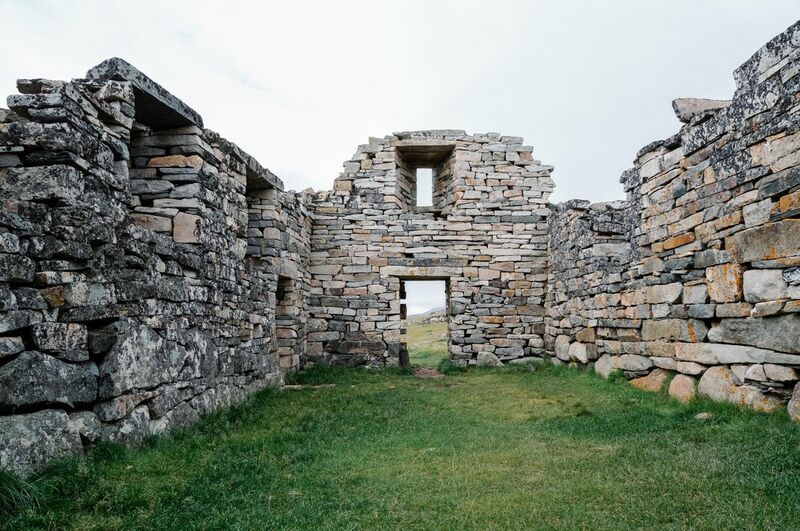 The Catholic Norse here were part of the now defunct Diocese of Gardar, which was administered by resident bishops from 1124 until the end of the 13th century, when communication between Greenland and Norway began to break down and the see went many years at a time without a bishop. Being historically minded, I have often wondered what it would be like to live out the Catholic faith in such a remote locale before the advent of modern communication. What would it have meant to be Catholic for these people? For Catholics living around the Hvalsey settlement, the universal Church would have had no other reality or expression other than what they experienced right then and there in their community. Their faith would have been radically localized. And there is nothing wrong with that. Remember, the Church's mark of universality/Catholicity means two things: (1) that local churches are universal because the profess the faith and administer the same sacraments that bind the Church Universal together, but also (2) because every local church is itself an expression of the Universal Church in a particular time and culture. The mark of Catholicity is as present in an isolated, cold stone church on the southern fjords of Greenland as it is in Rome or Paris, so long as the faith is being prayed and lived there. It is not necessary for a local church to be "plugged in" to the contemporary events of the Church Universal; being part of the Universal Church does not mean maintaining a certain degree of communication or media awareness of the events in Rome. It means living the faith of the Universal Church in your own local church. It is doubtful the people of Hvalsey had any accurate knowledge of who the pope even was. In an age when it could take news four months to get from Rome just to Britain, the people of Hvalsey's knowledge of current events on the continent might have been two or three years outdated, probably more. The name of the pontiff mentioned in the Roman canon at Mass each week might have been a pope that had been dead for four years. Similarly, the mainland Norse had little knowledge of what was going on out in the Diocese of Gardar; once, in 1347, Norway ordained a new bishop to administer Gardar and sent him out to Greenland only to find the previous bishop was still alive. The communication was so sparse and it had been so long since word had come from Greenland that the Norse authorities assumed the previous bishop had died. There was a great chasm separating Hvalsey and the Norse settlements from the outside world, at least in terms of keeping atop of current events. If the Hvalsey congregation had no certain knowledge of who the pope was, they certainly weren't abreast of the latest gossip going on in the Roman Curia. The pope to them would have been a very distant juridical concept, someone whose existence they knew of and whose authority they acknowledged but whose judgments rarely if ever touched their lives personally—similarly to how an American might view the Chief Justice of the Supreme Court, except even more remote since we at least know who John Roberts is and what he looks like. The pope was not someone who impacted their daily life, if they even knew who he was. My friends, that is how I have been living these past few years. Not burying my head in the sand and ignoring bad things I hear, but remembering that the expression of the Universal Church that affects me most is the one right in front of me that makes up the community I live in. My actual, tangible experience of the Catholic Church is not what is happening in Rome, but what is happening in my parish, in my community, or in front of the quaint little candle-lit altar in my own home. But when it comes to Rome, I'm mentally existing as if I'm in the Hvalsey settlement in the year 1000. That's my option for living the faith in these troubled days. Stuff in the Vatican is getting wilder by the day. I'm thankful there's sites like 1 Peter 5 covering it, and I'm sad there's people whose faith is being harmed by the scandals. It hasn't harmed my faith, though, and for me it is simply one of those things where I shrug, say some extra prayers for the Church in my daily routine, and go back to reading more wholesome spiritual materials from an earlier time. What's going on is objectively bad, but there is a sense in which focusing too intensively on it can be damaging. I am not saying to ignore the realities we are in or totally disconnect, but I am saying let us remember that the ground beneath our feet is the most appropriate locus of action for bringing Christ to the world. Think local. Act local. Pray local. If the Church needs exemplars of faithful Christian living, be that example in your own community. It's was one of those Sundays where I walked in late for Mass, which in my small parish, can sometimes mean not being able to find a place to sit. That's okay, though. Sometimes I prefer to stand in the back. I find that standing often helps me be more attentive. I meander to the back of the parish and take my position at once of my favorite spots: over a very old, iron grate atop a vent connected to the parish's ancient furnace. It's a chilly fall day, so when the deep rumbling from the basement signifies the heat is turning on, atop this vent is a very nice place to be standing. The Mass itself is not very memorable. To be honest, my mind is not where it needs to be. Five minutes after the readings, I can't remember what they were. The homily seeps into my head and just as easily drains back out. My responses are mouthed coldly and thoughtlessly. The prayers of the Eucharistic liturgy all blur together. I try to focus and prepare my soul for Communion the best I can, but my soul feels dreary. After the Agnus Dei and the communication of the priest, the congregation begins filing up to receive Holy Communion. I am kneeling over the grate, my legs super-heated from the furnace. The playing of the organ commences, and a familiar melody flows out of the choir loft. "Ah, Mozart's Ave Verum Corpus," I think. A feeling of warm, pious nostalgia settles over me as I watch the lines of people slowly processing to the front of the church to receive the Body and Blood of Christ. The soft glow of the candles, heat blowing up from the grate beneath my feet, the sweet melody wafting on the air—they all seem to bathe the scene in golden warmth. My heart begins to be deeply moved, not only from the melody of Mozart's timeless piece, but by old memories stirring in my breast. It was a warm, spring day in 1998. The kind of day where the Mr. Bushey, the choir director, would prop the doors to the choir room open to let in the sweet, fresh air outside. I am Tenor 2, seated in the third row of the center. There's not very many of us Tenor 2's in the high school's Acapella Choir, so if I am not up to par on my parts, it becomes very evident. I'm not very good at sight-reading though. At 17 years old, I'd only begun my formal musical instruction a year earlier. I still rely on the few superstar singers in the choir to orient myself; I often "copy" the other tenors without understanding what I'm doing. I'm sure some time I am singing Tenor 1, sometimes Baritone depending on whose voice talent I am siphoning off of. Even so, choir is a fun class. We'd been preparing for our spring concert all morning, and Mr. Bushey was attempting the impossible task of keeping several sections of the choir hushed while he worked with the sopranos and altos on their parts; it seemed like the soprano section always got the most attention. Most of the songs were banal and forgettable: sappy Barbara Streisand sort of stuff, or old Rogers and Hammerstein show tunes from musicals most of the students had never watched. I probably devoted only a third of my energy to concentrating on the music; the rest of the time I was fooling around with my buddies or completely daydreaming. That's why most high schoolers signed up for choir anyway. After a few moments Mr. Bushey ends his work with the girls and announces he is introducing a new piece to the spring concert. We all groan. It's already late in the year, and we all know that introducing a new piece this late will mean lots of very intensive rehearsals. He passes out the sheet music. Ave Verum Corpus. Arranged by W.A. Mozart it says atop the music. Now, I knew nothing of Latin at the time, but I knew enough to at leas recognize this as a Latin title and to know who Mozart was. It was not entirely surprising we were singing a religious text; yes, it was a public school, but because so much musical heritage of the West is religious in nature, the educational guidelines dictated by the government allowed for a certain percentage of religious music to be sung in school choirs, otherwise public school choir programs would have little to sing; such was the vast size of the religious musical patrimony of the west! This song piqued my attention; though not religious, I definitely preferred singing a Baroque religious melody to a 1960's musical show-tune. Mr. Bushey got our attention and gave us some introductory remarks on the piece. As he spoke, I flipped through the little booklet. The Latin was not translated; it was simply there on the page, asking neither to be translated nor understood but merely sung. I was intrigued by these words and phrases. De Maria virgine...pregustatum...in cruce pro homine...in mortis examine. The words meant nothing to me, but the very look of them, the structure, the sounds...they had an almost mystical quality, like some kind of ancient runes or sigils. Then Mr. Bushey got to explaining the meaning of the text. He said he'd been down to visit one of the literature teachers who had a working knowledge of Latin and got a rudimentary translation (this was before most people were using the Internet). He then gave us a clause by clause translation. I was enthralled by these strange words. "Hail, true body, born of the Virgin Mary, having truly suffered, etc." Everything was so matter-of-fact. He offered only the translation of the words, no context or meaning—and indeed, how could he? He was just a choir teacher who had found a good piece of music, not a theologian nor even a Catholic. The most interesting phrase for me was the last: "Be to us a sweet foretaste of life everlasting in the hour of death." I jotted the translation down with a pencil in the margins of the sheet music while Mr. Bushey read it. Then came the first run through. He gave the music to the pianist and selected a few students who were excellent sight readers to preview the tune for everybody. There, for the first time in my life, on the rustic piano in my high school choir room, I heard the beautiful, iconic introduction to the famous Ave Verum Corpus of Mozart. Though the rudimentary run through I heard sung to me that day was far from perfect, it was enough for me to be moved deeply by the melody and the words. I did not understand what I was hearing; the aesthetics alone were responsible for softening my heart. It was absolutely beautiful. As the choir director began teaching us our respective parts, I really had a strong desire to do this piece well. It's very beauty demanded it. I remember taking the sheet music home and reading those mysterious Latin words and their penciled in translation to myself in my bedroom alone. "Be to us a sweet foretaste of life everlasting"; these words were cryptic and beautiful, but what could they possibly refer to? I remember that spring our choir went on a little tour. The school chartered a bus and we drove down to Pittsburgh to sing in some of the historic theaters around the city. The bus ride down was a big gaggle. Just a bunch of seniors laughing and messing around and throwing things, all of us at that peculiar age when one is old enough to take on adult responsibilities but still enjoy acting like a child whenever possible. The ruckus in the back was getting a little out of hand. Mr. Bushey, who was seated in the front, got up and shuffled his way to back of the bus. He did not scold us; rather, he tried to divert our energy to something more productive. "C'mon gang," he said, taking a seat, "let's rehearse a little bit. How about we run through the Ave Verum Corpus?" The choir began to settle down and compose ourselves in preparation. Mr. Bushey stood up and assumed his directorial manner, though hunched over to avoid bumping his head on the ceiling of the bus. He took out a pitch pipe and sounded the notes for each section, then waving his hand to set the tempo, we began the song. "Ave, ave...verum corpus...natum, de Maria Virgine," we all began. The acoustics inside the school bus were actually perfect. There's something surreal about such lovely music arising suddenly in such an unlikely venue. I didn't know what this piece really meant, but I do know that there was something so very moving about a group of high schoolers sitting around in the back of a bus going down I-80 towards Pittsburgh singing this beautiful hymn. The splendor of the song brought out something, made us come together...made us get a glimpse—even if in an imperfect manner—of a whole realm of goodness and truth and beauty and culture beyond what we would normally experience in our small town high school in southern Michigan. In later years, I have often thought about how far away from Mozart's intentions we were when singing that song. Mozart composed that music for solemn use in the Catholic liturgy; that a bunch of sloppily dressed, rambunctious high school students in the United States should ever be rehearsing it in the back of a school bus for a secular concert tour was never something Mozart ever would have contemplated. But then again, in another way we were fulfilling his intentions perfectly. 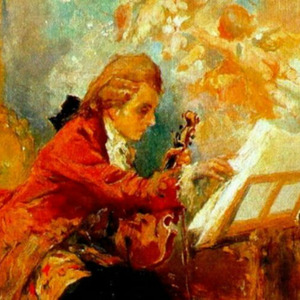 For in composing such a piece, Mozart undoubtedly wanted to show forth the beauty and deep mystery of the Incarnation. And while I could not have understood it in such explicit terms, there is no doubt that I, that all of us, were deeply, profoundly moved by the beauty of the piece. And in experiencing such beauty, even on the back of a school bus, I was in a sense experiencing a foretaste God Himself. The eruption of the divinely beautiful into the ordinary world is what the Incarnation is all about, and as such it is a true manner of coming to know and appreciate God. And surely that experience would have been well within Mozart's intentions, for what composer does not wish his music to be found beautiful? It was early June, 1998, the week of the spring concert. I was mulling around backstage in my long, choir robes—green and yellow, the color of my school, the school district I had attended for thirteen years. It was a bittersweet time. This was the the last time I would ever walk out onto this stage, the last time I'd ever sing with these people, most of whom I'd attended school with since the very beginning. Graduation was only a few days away. A whole new epoch of life was about to begin even as the only one I'd ever known was closing. We were all milling about backstage waiting for our cue to go on. The high school had many different choirs, of which Acapella was only one and by no means the best. It was a very emotional moment, waiting to take my place on the choir stands the last time. I had not always taken choir very seriously, but in this moment, as my time here was about to end, I found myself wishing I had. As I walked about backstage I ran into a fellow classmate, a girl name Jamie. I had known Jamie a long time. Way back when I started 1st Grade, I remember the students all had to share lockers in my tiny elementary school. Jamie was my locker partner back then. We both stood there momentarily in our green robes backstage, looking at each other silently. My mind raced back to the first day of 1st grade in 1986; I remembered my teacher introducing me to Jamie outside my locker. "This is Jamie. She's going to be your locker partner." We shared our locker all that year, but after 1st grade I never talked with her much. Ah, how much time had elapsed between that first day of 1st grade and now, when graduation was only a few short days away! Was it all over already!? How much had happened in those intervening twelve years, but then again, how brief it had all seemed. And there Jamie was again, like a punctuation mark at the end of my public school career. I don't know what she was thinking, but I imagine similar thoughts must have went through her mind. Her eyes got blurry with tears. And at the sight of her my lip began to twitch and quiver and my eyes welled up, too. We both began balling simultaneously and embraced each other in a hug of sincere affection and esteem. I hadn't talked to Jamie in a long, long time. I had no idea where she was in life nor did she know much about where I was. It didn't matter. We knew this was a special moment. We hugged for a long time, then looked at each other with tears in our eyes and big dumb smiles and said nothing. Our hug was broken by the sound of applause from the crowd. "Acapella, you're on!" called someone. We all rushed out onto the stage and took our places on the stands. On a stage like this, you can't see the crowd. You have no idea who is out there or how many. All you see is the blinding stage lights beaming their heated brightness down upon you—and beyond them, just a black void. That's probably a good thing for the performer. Mr. Bushey came out, dressed in his black suit with tails and white bow tie. The pianist was before us, elegantly robed in a long, flowing green dress. The choir director smiled and composed us, focusing our attention on him and only him. "We're starting with the Ave Verum," he whispered. We were ready. We'd spent several weeks intensively learning the piece and every one of us knew every note intuitively. The pianist's hands fell upon the keys gently, playing the introduction to the piece we had all come to recognize. Mr. Bushey raised his hands and drew the music out of our open mouths. The music did not seem to be sung...it seemed to simply, emerge or arise from us; emanating from our mouths. It was so soft, but so beautiful. We always sung better on concert nights. It was as if the pressure compelled us to polish our skill to a level we didn't know we possessed. By God, it was powerful. Women the world over search, often in vain, for that elusive man who is both powerful and gentle—tender but strong, for that is the essence of true masculinity. I tell you, there is nothing that so perfectly exemplifies this curious balance of power and gentleness than men's voices singing bass and baritone with great skill. There was something so moving about these deep, masculine voices singing of the Incarnation in the womb of Mary. The little crescendo on immolatum makes you feel like you are approaching the climax of the song, but Mozart doesn't take you there yet. He resolves the crescendo in beautiful harmony on the word homine. How perfect. The tension on the word "sacrificed" ends with harmonious balance on the word "mankind." The way the melody shifts to a minor on the word sanguine tells you something is about to change. The music regroups, preparing for the high point of the song. We all took deep breaths; long hours of practice had taught us to know that we would need a lot of air for the next lines. When we all closed our mouths on the last syllable of examine, Mr. Bushey raised his hand aloft, calling forth the power of the altos and sopranos to exalt the mystery of Christ's redemptive power in the face of the mystery of human death. Ah! That moment is always so chilling, so beautiful. The sopranos stand alone, their voices piercing the darkness. As I reflected on this years later, it reminds me of the light of Christ piercing the darkness of death as He goes down to the dead to bring the faithful souls into beatitude. But I didn't know that in 1998. All I knew was that this moment was the most important moment of the song, when its beauty reached highest, when everything seemed to be hanging on a knife's edge. I took a deep breath. Mr. Bushey held out his hand in an agonized, clenched pose, and looked at the men. His hand reached down, forward towards us, as if he wanted to grab us by our guts and rip the power out of us—force us to put our soul in to it ad give this moment the sheer power it deserved. We knew it was time. We followed the sopranos, our voices ascending higher, chasing theirs. This was the absolute climax of the song, the crescendo towards which everything else was building. And it is the climax of every person's life, as well. The moment of death. In final trial at the hour of death. In mortis examine. It is fitting that Mozart chose to focus his crescendo on this phrase. Mr. Bushey's clenched hand trembled as he raised it aloft. Our voices followed, almost magnetically. I could see the sweat beading upon his brow and feel it on my own. Then, the resolution. The completion. The parts of the girls and the men (which had diverged for one, beautiful, tense moment) resolved themselves into an elegant, simple harmony on the last syllable of mortis and then brought everything back to harmony on the word examine. Stretched out into five syllables, the choir's stepped us down singing of examine takes us from the heights of that crescendo and brings us back to the world of human concerns, the place where our lives actually exist and where God's grace is operative mysteriously. Mr. Bushey closed his hands. Our lips fell silent and we stared out into the dark in a moment of silence before the crowd erupted in applause. All this memory and richness has passed through my heart in a matter of moments. I am again in my parish church, kneeling alone in the back atop the vent. My eyes are full of tears. The parish choir is in the middle of the Ave Verum Corpus. I hear the familiar lines, "esto nobis praegustatum..." I know what is coming. I take a deep breath. The sopranos launch their notes up into the heavens, and then, following behind momentarily, my own wavering voice takes up the part I learned so long ago. "In morrrrrrrrrrtis, examine." I remember the part as if it was yesterday, though some twenty-years have passed. My heart is on fire, my soul deeply stirred. Nostalgia, piety, the richness of the Christian mystery and just...the sheer aesthetic beauty of the music all overwhelm me. I make my way up the line, blinking away my tears. I throw myself upon the kneeler before the old Neo-Gothic wooden altar rail and receive the Body of Christ, which is truly that sweet foretaste of life everlasting. I am deeply conscious, much more so than usual, or the working of grace in my life and the imperceptible ways God had been nudging me, always nudging me, towards His truth for my entire life. God, when my hour comes, let me die in that grace. And let me always be cognizant of your providence. And let every moment of truth, or goodness, or beauty be to me a sweet foretaste of life everlasting. Amen.